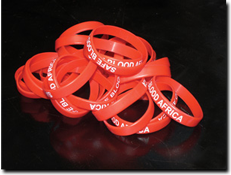 The SAFE BLOOD AFRICA PROJECT has been to three Rotary International conventions: Chicago, IL 2005, Salt Lake City, NV 2007 and Los Angeles, CA 2008; PETS training in San Jose, CA 2005, 2006, 2007 & 2008; GETS training in San Diego, CA 2006, 2007 & 2008; and many other events locally and statewide! PRIP Carl Wilhelm-Stenhammar, PRIP Wilf Wilkinson, PRIP Cliff Dochterman and PRIP Rick King have all seen and applauded this project! Blood Brothers; Carmel Valley Rotary spearheads Nigeria’s first safe blood donor system. On November 11, 2006 Warren Kaufman was asked to give a presentation of the SAFE BLOOD AFRICA Project, complete with Power-Point and a tidy speech. Over 300 people were in attendance that afternoon and the project was one of only eight chosen for the Rotary International Day at the United Nations building in New York City, NY. 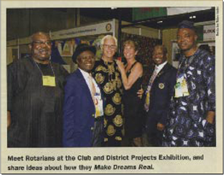 There has been much coverage lately in the Rotary International magazine. Click on the covers here to see the article or letter that has been printed and put a face to the information that is available regarding this life-saving and extraordinary project.